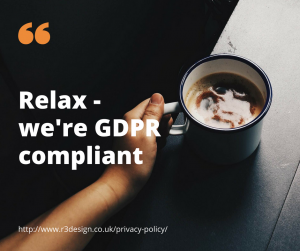 You are here: Home / Blog / News / Worried about GDPR? Take it easy…. Hands up if your email inbox has been overflowing with GDPR emails for the past week? Yes – us too! There has been a lot in the media about the new GDPR laws that came into force on 25th May. We take your data privacy very seriously, so we sent our office manager on a day-long training course to make sure we understood what the new regulations meant for us. She returned with an evangelical gleam in her eye and immediately started unearthing dusty files from the backs of shelves and asking probing questions about IT security! Since then, we have done a thorough information audit, so that we know exactly what personal information we hold, where we hold it, and how long we are required to keep it. At one point we felt a little like Michael B Jordan in Fahrenheit 451, destroying superfluous information! It’s been a really valuable exercise, forcing us to tighten up on our practices and address issues such as data retention and business continuity/disaster recovery. I’m sure we’re not the only business to have invested in more lockable filing cabinets and enforced a clear desk policy over the past few weeks! We don’t make a practice of sending out huge numbers of marketing emails, preferring instead to keep our communications tailored to individual sectors, so for simplicity we have deleted all our marketing lists are asking customers to opt in again if they are still interested in receiving an occasional newsletter roughly four times per year. If you would like to hear about new products and services relevant to you and your business, please sign up here!